Christine's Cards and Crafts: Anything But A Card at Winter Wonderland. Anything But A Card at Winter Wonderland. It is time for another Winter Wonderland challenge. Our hostess is Eileen and the theme she has chosen is "Anything But A Card". I made quite a few of these tea light holders last December to sell at our WI Christmas Fayre but totally forgot to photograph them so I decided tomake another one now and remedy the situation. Of course, remember to use a battery operated tea light - you don't want to set the place on fire ... lol! 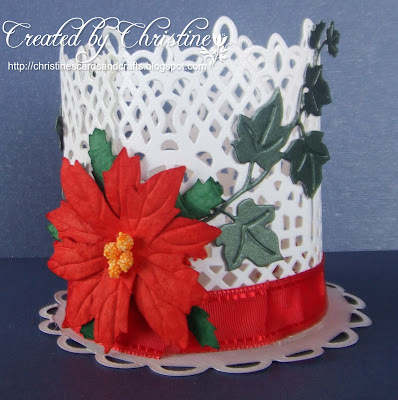 Please pop over to the blog and see what the rest of the DT have made and perhaps you might decide to join in with us. But please remember Christmas projects only! We have two sponsors this time. First is Di's Digi Stamps who will be giving $12 to spend in store. The second sponsor is Marianne Designs who will be sending the winner a super surprise. How exciting! The weekend is coming up - yet again - so quickly! I hope you have something exciting planned. A fabulous project - a lovely gift idea. Your adventure sounds like such fun, & so interesting. Very glad you had a nice day's weather to enjoy while you visited this place. Love this delicate, lacy tea light. How pretty this would look with several of these in a display during the holidays. Bet they are great sellers too! TFS & Happy wkend. This is just lovely! What a great gift it would make! Thank you for joining us at ABC Challenge! Good luck and I hope you will join us again with your lovely work! This is a beautiful Christmas table decoration Christine, is that a Heartfelt Creations die? They are actually frame dies but one looks like chain links and that's what I used. Hope you are enjoying this lovely weather at the moment. Beautiful holder. You have made it look fabulously festive. I used this die the other day on an anniversary card as I'm trying to use my older dies. The rock houses sound interesting.